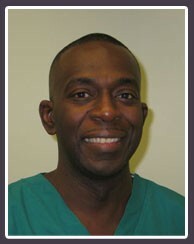 Dr. Hugh G. Allen is a 1990 graduate of the Howard University College of Dentistry in Washington D.C. He completed a Dental Internship in General Practice at Woodhull Hospital in Brooklyn, New York in July 1991. He then associated in private practices in Brooklyn, NY, Union and Trenton, NJ before moving his family to Miramar, Florida in September of 1996. Dr Allen has continued to excel in his field and his current practice has rapidly grown since opening on May 16, 2003. There are many factors that Dr. Allen attributes his success to. Foremost is the faith that when God places you in a position to do his work and you are obedient to that assignment, great things usually happen. Dr. Allen and his staff provide individualized care, "Our patients feel like they are family. We truly care for our patients." Dr. Allen is great one on one, has excellent chairside manner and is a great listener. Patients are always complimenting on his touch. Not uncommon is the quote, " You're good with that needle, I didn't feel a thing." Dr. Allen and his staff are committed to providing the highest quality care and actually make the dental experience "pleasant". To this end also, Dr. Allen has invested in the best of the latest technology to ensure his patients are getting the best possible care. Dr. Allen has been married to his wife Novel for 18 years and they have a daughter Danielle. He is an active member of the Covenant Seventh Day Adventist Church. In his spare time, Dr. Allen is usually in the gym (YMCA), reading or watching TV (Sports or CNN). He is an avid Washington Redskins' and Miami Heat fan. Dr. Allen is active professionally. He is a member of the American Dental Association, the Florida Dental Association, the South Florida District Dental Association, the National Dental Association, the Miami-Dade County Dental Society (Treasurer for 4 years), the Academy of General Dentistry, Academy of Laser Dentistry and CERECdoctors.com. He has completed many Continuing Education courses with special emphasis in Cosmetic Dentistry and Occlusion. He has participated in many community health fairs and career days. He has given his time and talents/money to homeless ministries and to "fostering an interest in careers in dentistry" in young African-Americans.